It is not an easy task to choose the right Web Hosting provider for your website or business on your first attempt. With so many options to choose from in an over saturated hosting market, it can be quite the hassle to find one that will fit your needs. Without proper guidelines, you will not be effective when separating quantity, quality and price and you will most likely endure frustration, spending too much on features you do not really need. I compiled a list of the features that is considered to be important when choosing a web host, and those influenced my top 5 decision. 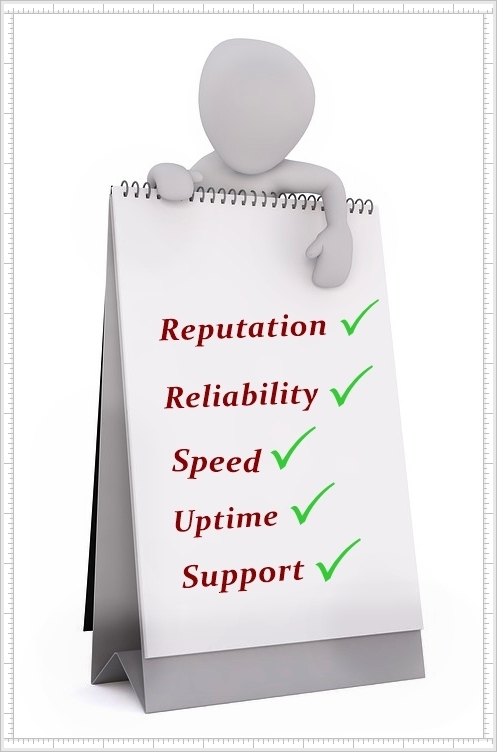 Uptime and Speed – Most likely the most important of all. No use to have a website that is down most of the time, so these are always the key factors when choosing a hosting company. To sum it up, uptime will indicate the quality of your site’s performance, bad performance equals bad traffic, bounce rate and revenue. Keep note; I will rather recommend a host with great uptime even if customer support is not 100%. User Interface and Control panel- Not everyone is a technical genius, nor do they have time to figure out a complicated program. I prefer companies, with an easy to use interface that enables everyone to use their services. Features offered – The Focus is not on the features that will not be needed in most cases, but on those that are used the most. This includes PHP, control panel, Perl, email, domain and WordPress integration, to only name a few. Customer support – Not easy to evaluate because quality of support can vary from one technical assistant to the next. Some might be skilled and helpful while others might still be trainees. A rating is based on overall customer support after multiple attempts to contact support. Feedback from other users – Also not easy to evaluate because fake feedback to boost the competition is a reality nowadays. Feedback only slightly influenced when choosing best rated programs. Awards and Reputation – A company that has received awards for outstanding services delivered are a good indication that the majority of its users had a pleasant experience. Rewards must be earned and thus a good indication of a company that strive to do better. Afordability VS Quality - I love the saying “you get what you pay for”. Cheap will not always be the best so the recommendations will be based on performance and not price. 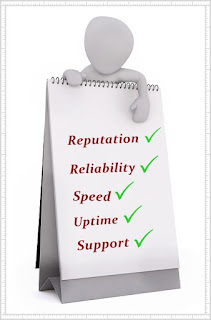 The following articles can help you decide what you want before choosing a hosting company. You do not want to choose a company because you like the way it looks and then regret it later on. InMotion Hosting has a record of helping small to medium sized businesses reach online success. They have hundreds of thousands of clients as a worldwide web hosting provider. With 3 offices, over 300 employees and thousands of servers, you can believe that they focus on providing the best possible services to their clients. They have won plenty of awards that prove that they want their clients to have a positive experience with their product. InMotion provides over 20 different types of hosting and other services. They have been a top rated hosting company for 14+ years and they spend a lot of time to make their platform the best. Managed and Self Managed VPS Hosting. 24/7 general support and outstanding technical support. Free backups and SSH access available. Free malware and SSL detection. Every registered domain comes with free setup and domain privacy services are offered. Loads of extras bundled into their plans that comes in handy. InMotion uses the latest SEO techniques to help build traffic. BoldGrid, a free premium website builder that comes with hosting plans. BoldGrid videos to help you build your website. Wide range of website hosting tools and software available. Shared hosting: $3.99-$13.99 per month. VPS hosting: $19.99-$64.99 per month. Dedicated hosting: $95.12-$519.49 per month. Reseller hosting: $13.99-$89.94 per month. WordPress hosting: $4.99 - $114.99 per month. 1&1 is currently the leading global internet service provider, with more than 13 million customers and hosting over 19 million domain names. Their data centers are among the most efficient and safest there is, which is easy to believe seeing as they have about 70 thousand high end servers, running parallel in operation. Every month 1&1 transfers, roughly 9 000TB of data and over 5 billion emails, with an external network connectivity speed of around 300GB per second. 24/7 phone and email support available. Managed Cloud Hosting: $14.99-$54.99 per month. WordPress Hosting: First Year $0.99-$8.99 per month. After First Year $7.99-$14.99 per month. VPS Hosting: XL plan cost $1 per month for the first 6 months and then rises to $29.99 per month. Dedicated Hosting: First 3 Months $40-$220 per month. After First Months $60-$240 per month. Business Email Solutions: $0.99-$9.99 per month. Online Store Builder: $9.99 per month and up. WooCommerce Hosting: First Year $0.99-$8.99 per month. After First year $7.99-$14.99 per month. HostGator is one of the worlds biggest and most popular hosting companies in the world, this is not very hard to believe, seeing as they host over 8 million domains. Their WordPress is easily installed with just one click. HostGator is the perfect solution, no matter if you are looking for a business host or personal host. HG is reliable so you do not have to worry if you are going to regret joining them. Pricing as low as $2.64 per month on a three year contract. Choose between Linux or Windows hosting. Well featured basic plan that is unrestricted in many aspects. No limits on bandwidth, disk space, FTP, MYSQL databases, email accounts and subdomains. cPanel-based management of your website. $200 worth of Google and Bing Ads credits. A 99.99% uptime is guaranteed. If downtime occurs, you will get a month's credit paid into your account. Dedicated IP addresses can be purchased. SSH available for technical site owners. SEO services to optimize your website. Shared hosting: $2.75-$5.95 per month. Reseller hosting: $19.95-$24.95 per month. VPS hosting: $19.95-$49.95 per month. Application hosting: $2.75-$5.95 per month. Dedicated hosting: $119.00-$149.00 per month. Website Builder: Starts at $3.95 per month. WordPress hosting: Starts at $5.95 per month. Owned by Endurance International Group, BlueHost and her sister companies HostMonster, iPage and FastDomain, host over 2 million domains. The company's servers are operated in-house at a facility of 50,000 square feet. BlueHost is always looking for new ways to satisfy their customers. They provide tools to millions of their users through the entire world. Beginner or pro you can start on the web with Bluehost. If you are a WordPress user, this hosting provider is definitely a provider to consider. Optimized WordPress hosting with management support. A vast amount of WordPress tutorials available to learn and make WordPress a breeze to master. BlueHost provides a website builder that is similar to Weebly. The BlueRock Platform is a control panel focused on WordPress that offers an integrated experience with WordPress. BlueHost offers a wide variety of domains to choose from, including, .Com, .Blog, .net and many more. Most of the BlueHost plans include unlimited domain hosting, email addresses, bandwidth and disk storage. Your website can be designed for you, with increased search engine rankings. You also get an account manager to review your campaign monthly. Security features provided are excellent. SSH access available for certain plans. Free SSD and Free SSL. WordPress hosting: $2.95-$5.45 per month. Optimized WordPress hosting: $19.99-$49.99 per month. Shared hosting: $2.95-$5.45 per month. VPS hosting: $18.99-$59.99 per month. Dedicated hosting: $79.99-$199.99 per month. Reseller hosting: $12.29-$29.69 per month. The company was founded in 1996 and is relied on to power 1.5 million websites. They have been a hosting company for almost 20 years, giving them a lot of experience. DreamHost will help you to create the website that you have always dreamed of. They have a community and support to help you to create your website faster and easier. They have even received the PCMag’s ‘Best Web Hosting Service’ award, not once, but two times in a row. It takes a lot of electricity to run servers, never mind being a web host. That is why it is great to know that DreamHost has been a carbon neutral company ever since 2007 after they started purchasing carbon offsets. They have neutralized 29,298.1 tons of greenhouse gasses in a time span of 10 years. Stunning Filters and Image Editing. One click installer for WordPress and other apps/CMSs. 97 day money back guarantee for the Shared Hosting products. You get a day’s service credit for every hour that their services are interrupted. Page loading times are not too bad in general. Powered by grids that obtain electricity from many renewable sources, including wind farms, solar panels, and hydroelectric plants. Evaporative cooling plants use a combination of municipal water and reclaimed water. Partners in state-level "clean wind" programs. Recycling bins in every office as far as the eye can see, even for single-serving coffee pods! Shared Hosting: $2.59 - $7.95 per month. WordPress Hosting: $2.59 - $16.95 per month. VPS hosting: $13.75 - $110.00 per month. Dedicated Hosting: Contact for pricing. Website Builder: $4.95 - $7.95 a month. Like always, I recommend caution when you start with a company you have not used in the past. Start with one website, and test the service yourself before you go big scale. If all fails, it is easier to move one site than it is to move 10. Have you used one of the Hosting Companies mentioned, in the past or present? Please be so kind to leave a comment and tell us about your experience. Always nice if a opinion is not one sided and shared by many, it will help others to make the right decision and save time and money. Thanks!